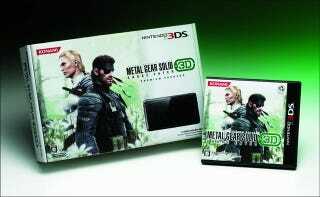 Want that Metal Gear 3DS? You Won't Like This. Konami is releasing a special Metal Gear Nintendo 3DS. Good luck on trying to get one, though. You'll have to jump through all sorts of hoops. Not only is Konami selling it through its online store Konami Style (ungh) for ¥22,980 (US$299), it's only being sold by raffle—to those who register with a Konami ID. If you don't have a Konami ID, you'll need one. And then, you may not even get the thing, but Konami has you registered. Yeah, that's fair. If people want this special 3DS, why not make it available to them, Konami? Why make things harder to get than they should be? Why make people register with Konami Style? Why, why, why?